A classic Second World War American fighter plane that was originally designed for use with aircraft carriers. F4U Corsair was an American fighter that served its users in both WW2 and the Korean War. The Corsair that was manufactured by Goodyear was in use up until the 1960s, before it was replaced with newer models. And let's not forget that this was the machine the Japanese were most afraid of - it has been calculated that one Corsair shot down 11 enemy planes before being destroyed. So the model is as famous as the P51 Mustang. 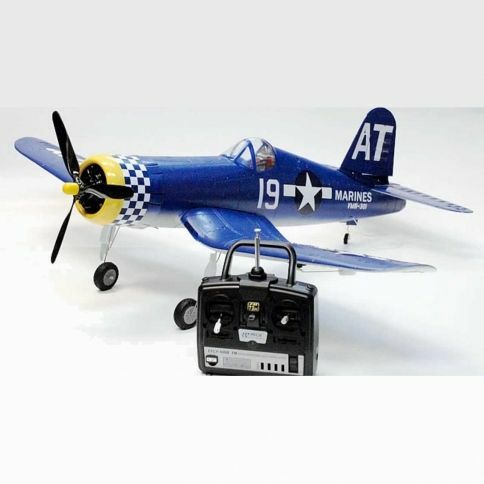 Just attach the wings and the rear end, plug the battery into the charger, and in less than 3 hours you're in the air. Once airborne you can start performing Corsair-like maneuvers. Barrel rolls, loops, and whatnot. The wingspan is about a meter and the range is a bit less than 850 meters. So don't be mistaken, you need a wide and large area to fly thins plane. And once in the air, you'll feel like you're in the seventh heaven. The authentic, 3-blade rotor gives a good amount of propulsion, but doesn't make the plane go too fast - and the wide stance of the landing gear gives you a good feel of the ground and of the handling of the plane when landing. The wings give a good lift and full controls at even slow speeds. However, the profile of the wings is such that you have to constantly micromanage the controls, so it's not a forgiving plane. Beginners, beware! Fly time with a single charge is about 10-15 minutes. So, it's a real radio-controlled plane, and the pilot should have some previous experience. We don't replace broken Corsairs with new ones, but spare parts and supplies are normally available, and you can ask for them via email.